Like any delicious Greek sale (see my Greek-ish Salad), you have tomatoes, olives, cucumbers, and feta. Also, to make this extra healthy and little more herbaceous, I’ve made the base kale and added some fresh parsley. Btw, did you know you can make your own feta cheese from scratch? 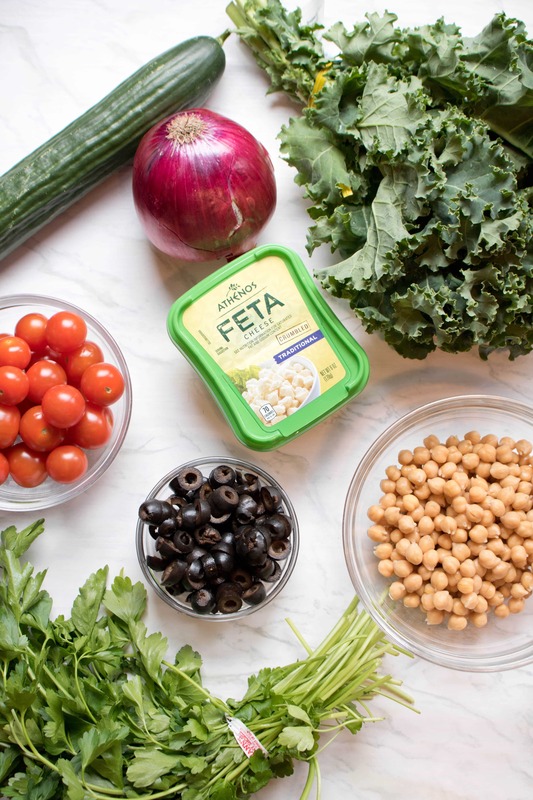 It’s a labor of love, and let me tell you with two small kids it is not something we’ve been able to do recently, so we’re using one of our favorites, Athenos Feta Cheese. But in a couple of months I think M will be ready to help as she’s getting to be more and more excited to be in the kitchen! that are roasted to crunchy deliciousness. 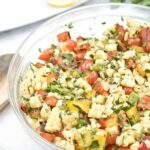 While the chickpeas are roasting, just add all your veggies and the feta cheese to a bowl and then decide how ‘dressed’ you want your salad to be. Now before you add the other veggies to the bowl of kale, you have to be sure to massage your kale with olive oil and salt. 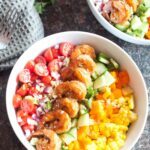 This brings down the bitterness of the kale. 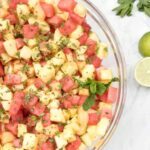 Because of this, I decided to just add some fresh squeezed lemon juice over the veggies, gave it a good mix, and called it good. However, if you prefer a more dressed salad, then I highly recommend some simple lemon vinaigrette that we use in our Greek-ish Salad. 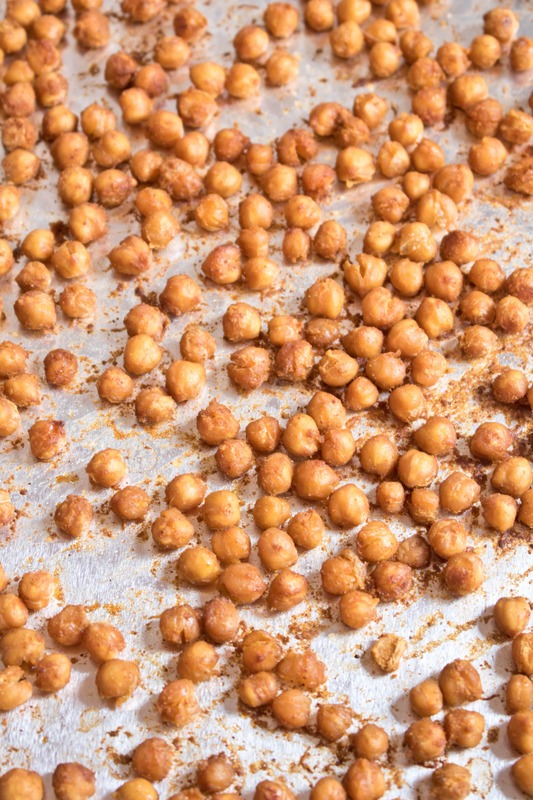 Give it a good mix together and then top it with the crispy, spicy chickpeas, and boom. 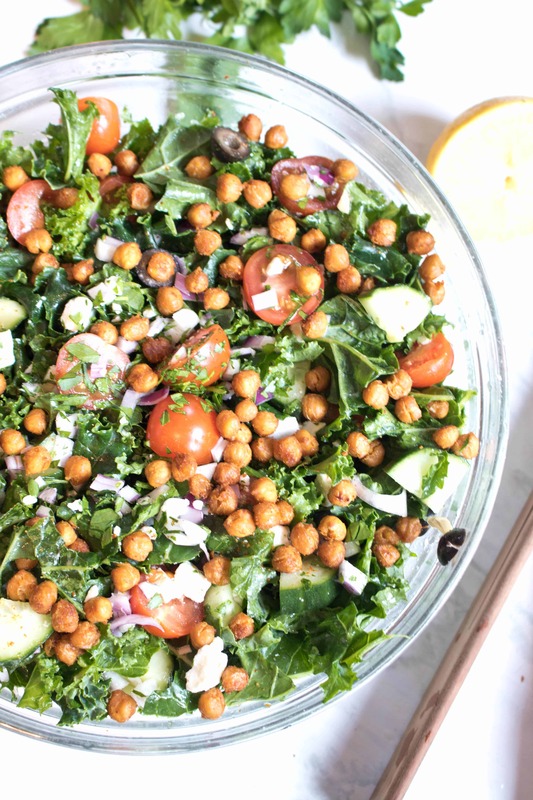 A super healthy, Chickpea Kale Greek Salad. 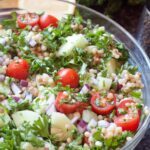 Full of nutrition, the classic flavors of a Greek salad, plus the spice and crunch from the chickpeas. 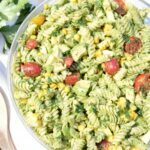 The perfect way to stay strong with those New Year healthy eating resolutions into the second month of the new year! Pre-heat the oven to 400 degrees and line a baking sheet with aluminum foil. Mix all of the spices for chickpeas in a small bowl. 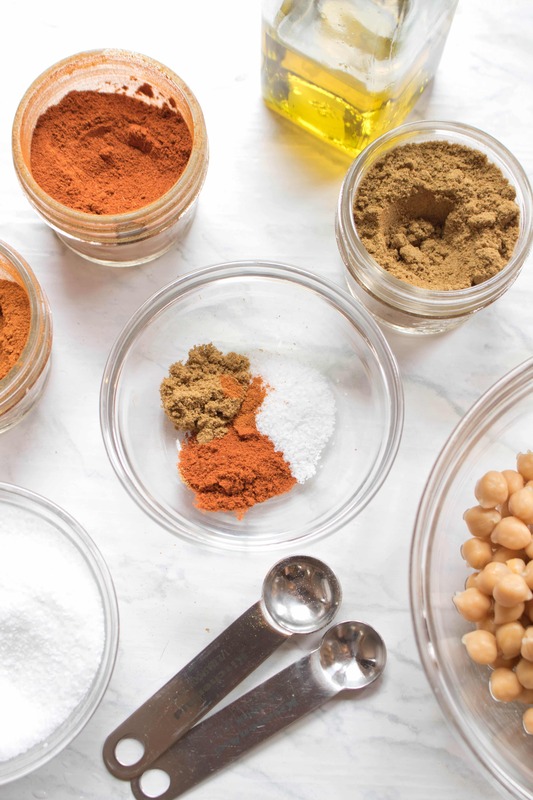 Add olive oil to chickpeas and mix before sprinkling on spices and stirring well. Add them to baking sheet and spread into a single layer. 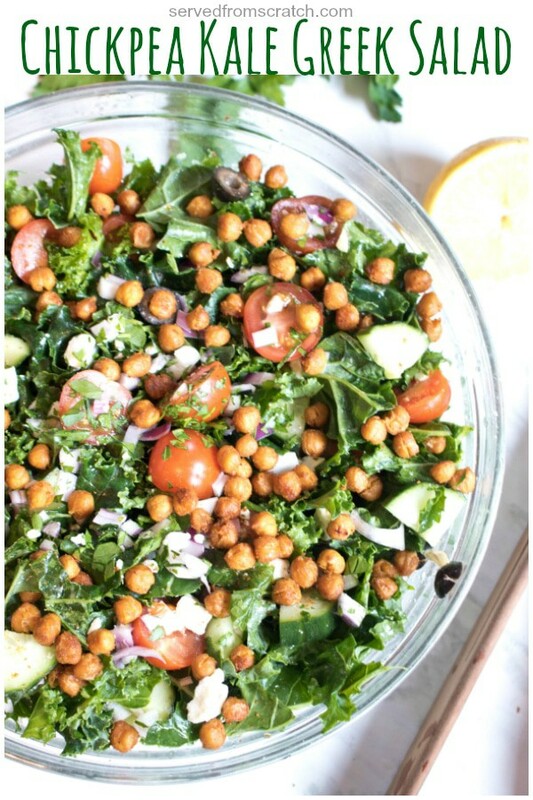 Meanwhile, add trimmed kale to a large bowl and drizzle 1/2 tablespoon of olive oil and sprinkle 1/4 teaspoon kosher salt. With both your hands, massage oil and salt into kale until all is well combined and kale begins to soften. This will release some of the bitterness of the kale. 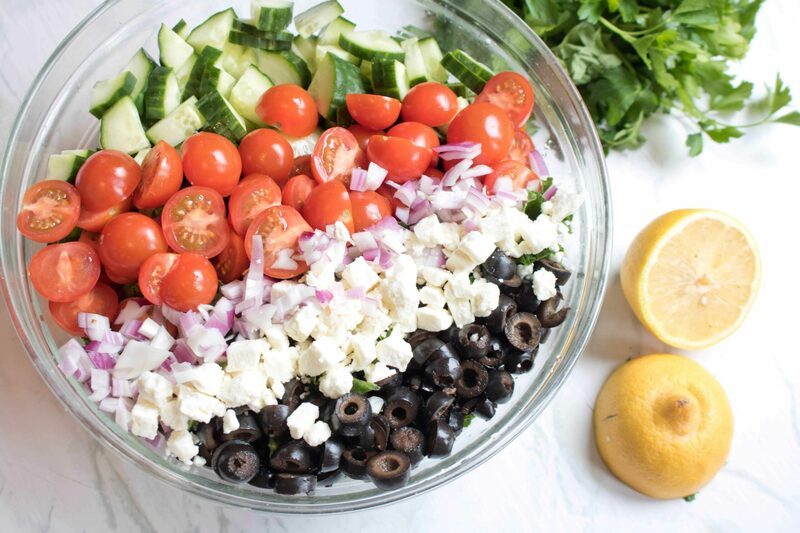 Add the rest of the salad ingredients to the bowl - tomatoes, cheese, cucumber, olives, and parsley and mix well. Now you can choose to just add juice from 1/2 a lemon to the bowl and mix, or add some of the vinaigrette to taste, and then mix. 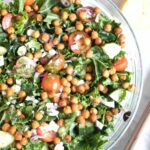 Add crispy cooled chickpeas before serving and enjoy!